Hey guys, I'm hosting our June Design Collaboration this month, I'm so excited! 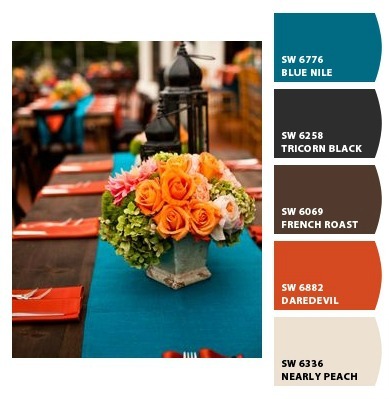 The inspiration photo I chose for June has warm colors that I love in teal, orange, brown and cream - and I immediately thought these colors would be fun on a hip outdoor patio or deck. 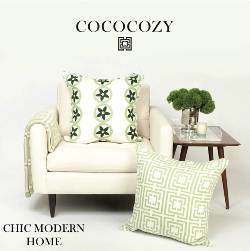 The overall design makes me think of Summer (and even Fall) in Southern California! This outdoor design is modern, comfortable and just the perfect place to relax on cool and breezy Summer evenings with family and friends. 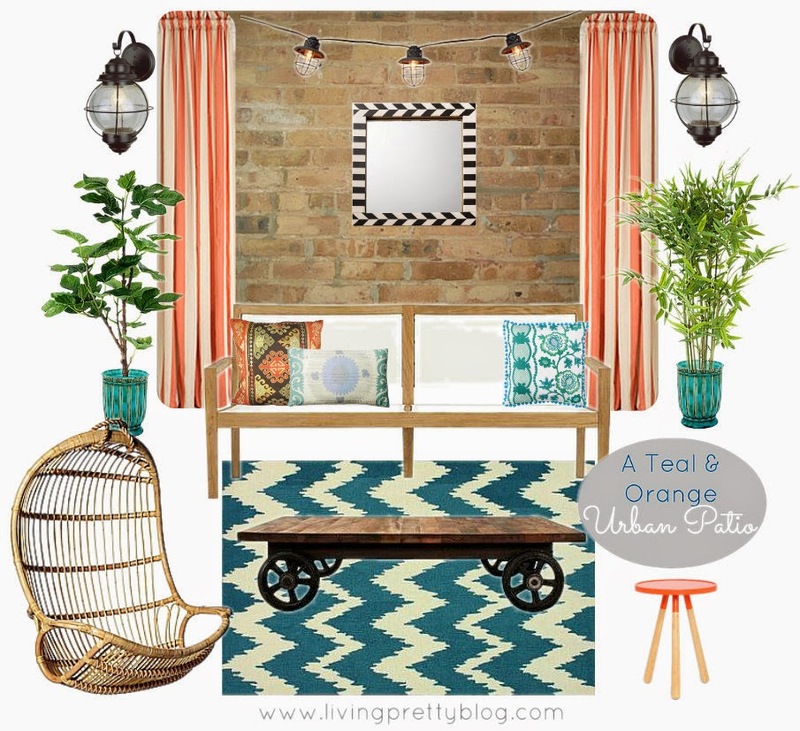 Lizzy from Living Pretty created this cool sheltered urban patio. She went for an urban patio, and mixed in a lot of indoor elements to create an outdoor sitting room. Lizzy is also in LOVE with this Rattan hanging chair! I couldn't agree more! 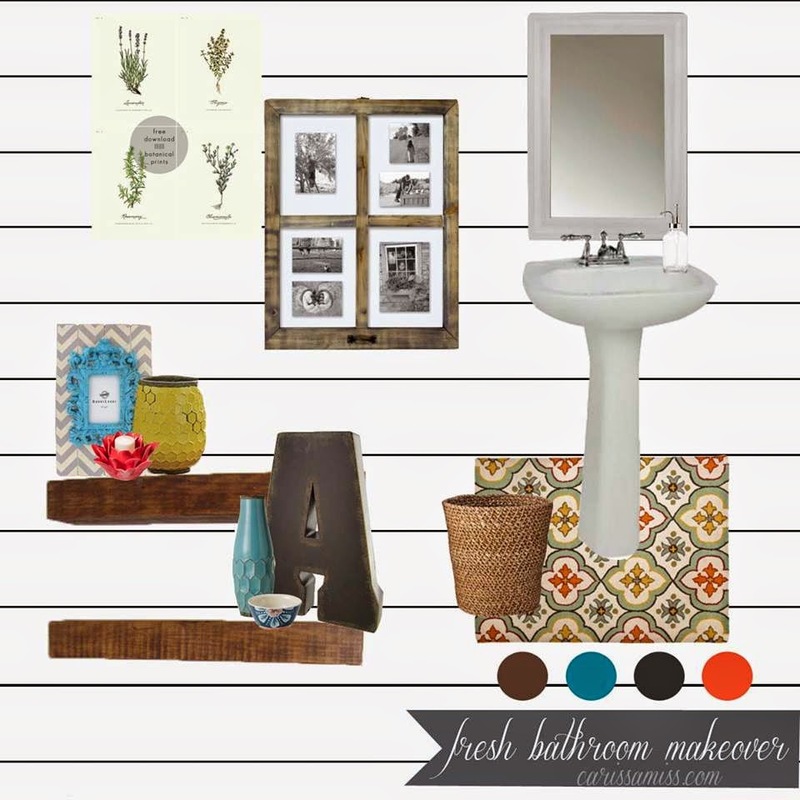 Carissa from the blog Carissa Miss created this eclectic bath refresh above for about $300 complete with plank wall & chunky shelves tutorial! 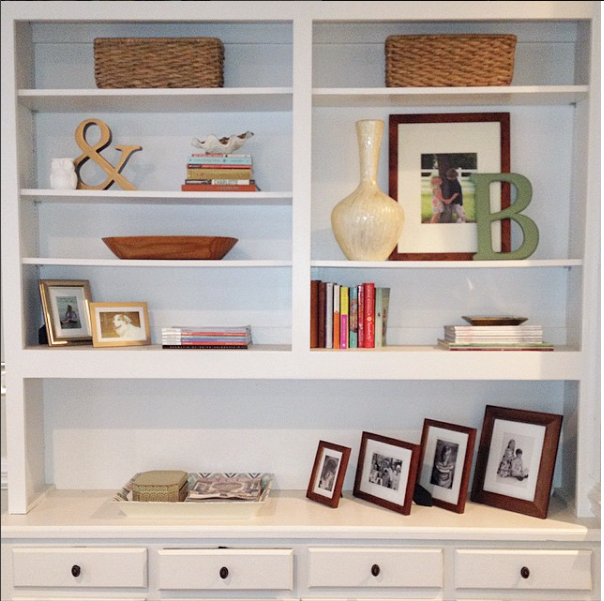 Ahhh, love those rustic chunky shelves! Okay go here to find the complete source list. 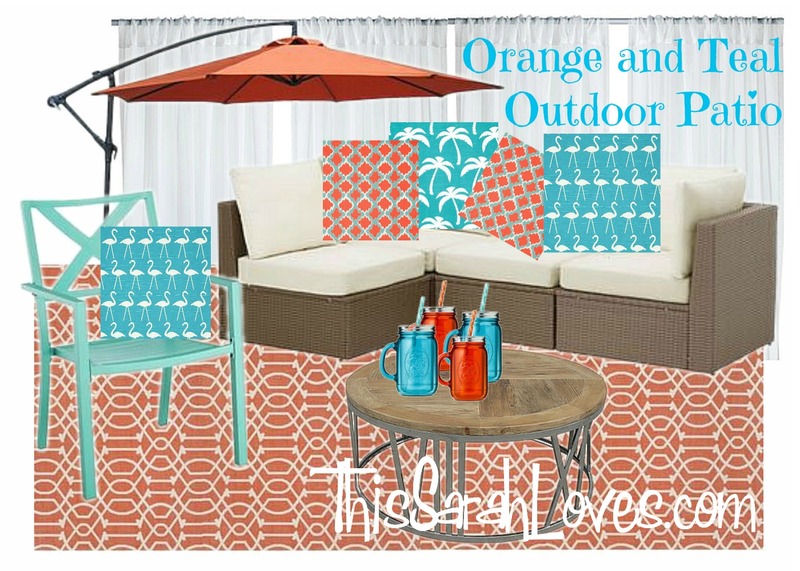 Sarah from This Sarah Loves created a relaxing patio! I love the play on patterns here. And instead of teal and orange, she used turquoise and orange...perfect for Summer! 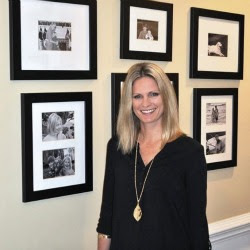 Stop by Sarah's blog for a complete list of sources. Okay guys we do a Design Collaboration every month, so check back for more creative fun with Inspiration Photos! Great boards! Love all the colors! I do too! I think because you can go dark with teal and dark orange. Or go lighter with turquoise and bright orange. Just depends on your personality! 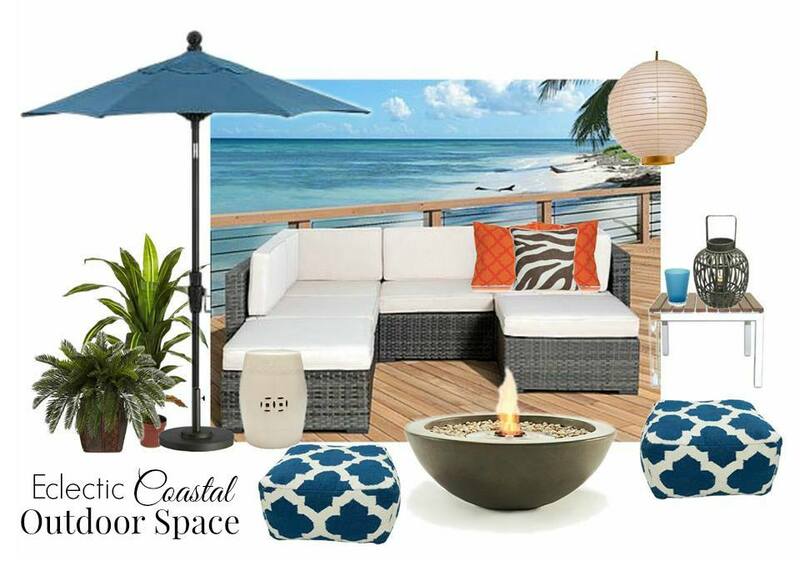 Jane, I want to be sitting in your Eclectic Coastal Outdoor Space this weekend! It's fabulous and the colors are really fun and vibrant. Thanks Lisa, yes it would be nice to be in Southern Cali on a gorgeous deck overlooking the ocean ;) unfortunately though we live on the East coast so California won't be in our travel plans anytime soon! All bias aside, I love your mood board the most! 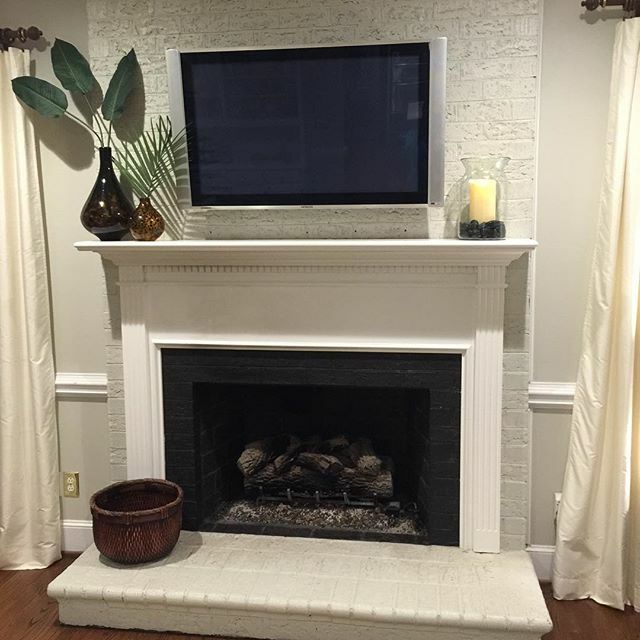 Great job Jane! Thank you Vel :) I really love the Urban patio too! 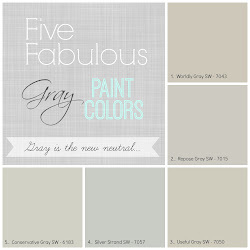 Awesome design & color combos love them! Says Summertime all the way!